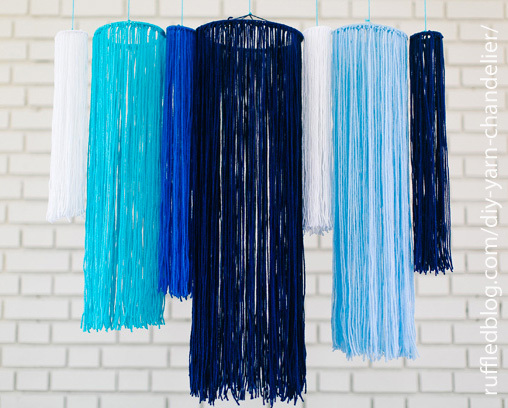 Professional wedding photographer Emily Chidester captured this shot of Kathryn Godwin‘s (Studio Cultivate) diy yarn chandelier project as posted on RuffledBlog. I LOVE this project and so easy to do. Just yarn, some rings and a pair of scissors! An installation artist and stylist, having graduated from Florida State University with a BFA in Studio Art. Though a drawing/painting concentration in school, she played with a wide range of mediums. Exploring the technicality of printmaking and photography, to the layered richness of fiber and textile work within installations and sculptures. i love shooting weddings because of the human connection. i’m a firm believer in the notion that we were not created to be alone, so when two people find each other in this crazy world and pour into building one another up, loving each other through the beautiful and messy moments, commit to exploring themselves, life and spaces together – i want to be a part of making those memories tangible for them. View more of wedding-related projects via RuffledBlog’s DIY page.